2015 Domaine Paul Jaboulet Aine, Crozes-Hermitage Rouge, Domaine de Thalabert, Northern Rhone, France. This Jaboulet Crozes-HermitagevDomaine de Thalabert 2015 with it’s concentration, ripe flavors and refined tannins is a lovely and impressive effort, not without grip or intensity, displays a meaty soul and terroir driven personality with layers of boysenberry, damson plum, blueberry compote, creme de cassis, fig paste, light cedar notes, mocha and earthy/tar like elements with hints of black licorice, leather, bacon fat and embers. Caroline Frey and team have done a masterful job, making a purple/garnet hued wine that gathers itself with air adding a hint of sweet toasty oak, with about 20% new barrels were used and crushed violets and candied black cherry in a sultry, seductive and a full bodied effort. Still in throws of youth, this Domaine de Thalabert will need plenty of cellar time to fully evolve, but the potential is clear as day to see in the bottle, curiosity got the best of me, rather than common sense, as I should have cellared this beauty another decade at least. The Domaine de Thalabert Crozes-Hermitage site was the first vineyard purchased by Jaboulet and is considered one of the benchmark vineyard sites in the Appellation as well as being the oldest, it now sports 60 to 80 year old vines, biodynamically grown on pebbly terraces that are glacial in origin, with the bedrock close to the topsoil. These small, round pebbles store heat during the day and release it at night, providing optimum and regular maturity, a bit like Chateauneuf du Pape and why these wines tend to be bigger and denser than most, especially in vintages like this 2015, making for a stunningly powerful and rich Syrah that rivals some Hermitage and or Cote-Rotie(s)! Caroline Frey’s ultra exceptional Domaine de Thalabert Crozes-Hermitage 2015 is a beguiling pure Syrah with fruit that came from one this zones most prestigious spots. Jaboulet is one of the iconic estates in the Northern Rhone, most famous for their La Chappelle Hermitage Rouge from the spiritual home high up on Hermitage Hill overlooking the Rhone River, and the Frey family, who took over this legendary domaine 10 years ago have proved to be great stewards of these holdings. Domaine Paul Jaboulet Aine, according to the winery, was founded in 1834, a full 100 years before the introduction of the A.O.C. system, by Antoine Jaboulet, who began to transform a sleepy region into one of the most important quality winegrowing terroirs in the world. Since that time, Paul Jaboulet Aîné has become the benchmark in the Northern Rhône, with the mentioned illustrious and iconic Hermitage ‘La Chapelle’ being responsible for some of the greatest wines ever produced. And now with Caroline Frey crafting the wines, this label is as popular as ever with her top wines being as highly praised and sought after as any in France. 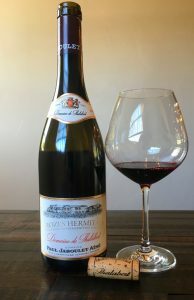 For those that cannot afford the La Chapelle, like me, it is great to be able to drink Frey’s wines, and this Crozes-Hermitage “Domaine de Thalabert” is a great one to invest in without too much guilt, so be sure to look for it and be as patient as possible, plus in case you don’t find, as great as this 2015 is, I understand the 2016 and 2017 should be as good if not better!